Shawna Robinson .Michelle Theriault . . . .
Menstuff® has information on the Automobile Racing Club of America. Automobile Racing Club of America (ARCA) is an auto racing sanctioning body in the United States, founded in 1953 by John Marcum. The current president of ARCA is Ron Drager. The ARCA RE/MAX Series races stock cars similar to those seen in past years in the NASCAR Sprint Cup Series, and indeed most cars used in the RE/MAX Series were previously used in NASCAR. ARCA's competitors contain a mix of both professional racers as well as hobby racers alike, in addition to younger competitors trying to make a name for themselves, sometimes driving as part of a driver development program for a NASCAR team. Most ARCA RE/MAX Series races are broadcast on either MavTV or SPEED TV. ARCA also sanctions a truck-racing series called the ARCA Lincoln Welders Truck Series and owns both the Toledo Speedway and Flat Rock Speedway. ARCA formerly sanctioned the ARCA Midget Series from 1988 until 2002. Marcum founded the Midwest Association for Race Cars (MARC) in 1953 as a regional stock car racing series after working as an official for NASCAR founder Bill France, Sr. In 1964, the name was changed to the "Automobile Racing Club of America" when the series became national by racing on superspeedways. This ARCA is not to be confused with the organization founded in 1933 with the same name (now known as the Sports Car Club of America). ARCA started racing at Daytona International Speedway in 1964, during the Daytona Speedweeks, at the request of Bill France, Sr., who had raced against Marcum in the 1940s. The ARCA/NASCAR relationship continues to today. The series frequently schedule events at the same track on the same weekend. The ARCA event is frequently the Saturday support race to the Sunday NASCAR Cup event. For several decades, ARCA used older NASCAR Cup racecars at their events, and with the advancement of the Car of Tomorrow, teams have been able to sell off older cars to ARCA teams; current Sprint Cup drivers Joey Logano and Scott Speed each drove in ARCA in 2008, driving castoff Sprint Cup cars made obsolete by the move to the COT. Former NASCAR drivers, such as Benny Parsons, Kyle Petty, Ken Schrader and others, have competed in and advanced through the ARCA series on the way to successful NASCAR careers. ARCA is still often used as a stepping stone for hopeful NASCAR drivers. 43 cars started the ARCA Daytona 200 on February 6, including 6 women, three of whom finished in the top 25. Danica Patrick 6th, Jennifer Jo Cobb 17th and Alli Owens, who spent quite a few laps near the end running in 3rd until something happened and she dropped back to 23rd at the finish. The remaining three were unable to finished because of accidents. They were Jill George 31st, Leilani Munter 39th and Milka Duno 43rd. Six women qualify for the February 6th ARCA race at Daytona - Danica Patrick (12th), Alli Owens (19th) and Leilani Munter (25th). Milka Duno timed in at 36th, Jennifer Jo Cobb at 39th and Jill George at 46th of 47 drivers. The race starts Saturday at 4:30pm on Speed. Nine women tested at Daytona in December. If the ARCA series is a preview of the NASCAR field in five years, the December test at Daytona International Speedway suggests that there could be more female drivers in big-league stock-car racing. Nine female drivers participated in the test, and two more were on the entry list. ARCA, which uses mostly retired NASCAR Sprint Cup cars, is a comparatively inexpensive way to get superspeedway experience. Both ARCA and NASCAR typically require drafting experience before a driver can enter a superspeedway race, and the only way you can draft is to get on the track with a lot of other cars. This effectively rules out private tests, so drivers such as Danica Patrick, who likely would have preferred to be elsewhere the week before Christmas than spending three days at Daytona, had no choice. So what does it cost? Plenty of teams bring more than one car to Daytona, hoping to rent out the backup to help finance a team's main driver. Rental prices vary widely, depending on the quality of the car and the crew, how complete the rental package is (does it include tires and fuel?) and how desperate the team is for some income. During the Daytona test, there were cars available for $7,000 a day, or $18,000 for the three-day package. "I've heard figures as high as $65,000 for this test," said one veteran car owner. "All told, I doubt there are many drivers here who wrote a check for less than $20,000." Again, depending on the package and the quality of the car, a full season in ARCA costs between $500,000 and $1 million. Not cheap, but a fraction of what NASCAR Sprint Cup costs. Some of the female drivers at the ARCA test you have heard of, some you haven't. Here's a rundown on who they are. 1. Alli Owens (Daytona Beach, Fla.): A local favorite--she graduated from high school in Daytona Beach--Owens, 20, was the fastest female driver, in part because she moved to Venturini Motorsports from D'Hondt Motorsports this year, and Venturini cars were consistently the fastest--three of the top four times. What does that mean? Maybe not much--tech consisted largely of passing under a few optional templates. It is not unheard of for teams to run cars that are slightly out of spec to register some big numbers, as big numbers help find sponsors. 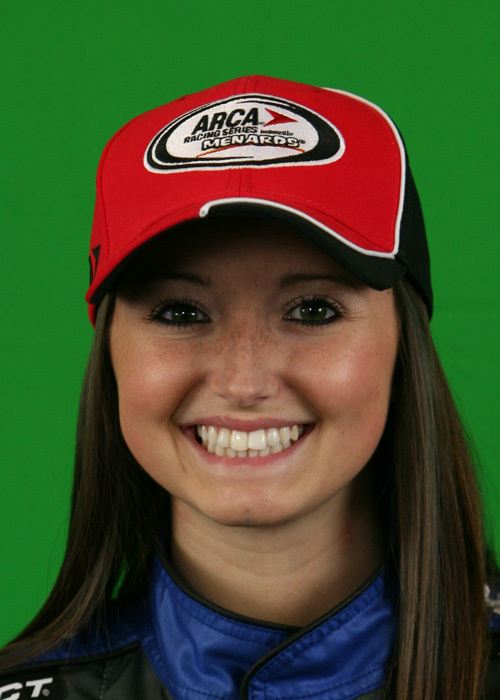 This is Owens's third year in ARCA, and she needs a win to prove she's more than just a good qualifier. 2. Danica Patrick (Roscoe, Ill.): Yes, you know Danica, 27, the IRL racer who has a deal with Dale Earnhardt Jr.'s JR Motorsports to drive a partial schedule in the Nationwide Series in 2010, when it doesn't conflict with her IRL responsibilities. She showed up with a pair of ex-Earnhardt Sprint Cup superspeedway cars--one raced at Daytona, the other at Talladega--and enough telemetry to launch the space shuttle. And having Tony Eury Jr. as your crew chief doesn't hurt. Patrick will race the ARCA race at Daytona to get superspeedway experience, and many of us think she will enter the Nationwide race at Daytona, though Eury has said her first NASCAR race could be at California. Patrick has to be a favorite for the ARCA race--she turned more laps in practice than anyone, she has the finest equipment, and she'll have a professional pit crew. She will qualify well. (In the words of Scott Speed: "You could put a monkey in the seat to qualify at Daytona.") If she stays out of trouble, she could, and should, win. 3. Milka Duno (Caracas, Venezuela): Duno, 37, a fellow IRL driver, bristled at the suggestion that she showed up for ARCA testing only because she couldn't stand for archenemy Patrick to get all the attention. She drove well and went fast, as was expected, since she was in a quick Braun Racing Toyota. She still hasn't said if she will be back for the race in February. 4. Leilani Munter (Rochester, Minn.): Münter, 33, showed up at the 2008 ARCA test in a car owned by James Hylton, but she wasn't able to find the money to run the race in February. This year, she was in a car owned by Mark Gibson, and she was fast and consistent. She has some experience in late models and raced in the Indy Pro Series, and she has done a good job of marketing herself not only as a race car driver but also as an outspoken environmentalist. It does not hurt that she has done modeling and once worked as a film double for Catherine Zeta-Jones--and it's good for conversation to note that her sister is married to a member of the Grateful Dead. She's fast enough to make the race in February--she just needs some sponsorship. 5. Jennifer Jo Cobb (Kansas City, Kan.): Cobb, 36, is well known in Midwest racing circles, not just for her own exploits but also for her father, veteran racer Joe Cobb. She began racing in ARCA in 2002 and has been in and out of the series since, with eight starts. She has also competed in some NASCAR Nationwide Series races. Cobb does a job good of marketing herself, and she can drive--one more female racer in search of sponsorship. 6. Ashley Parlett (Wye Mills, Md. ): Named one of the "50 most beautiful people in NASCAR" by Sporting News, Parlett, 26, is a part-time driver who worked on the pit crew as a brake and suspension specialist for the RAB Racing NASCAR Nationwide Series car. Parlett came up through karts and dirt sprints cars. She ran two ARCA races in 2006 but none since. 7. Jill George (Cedar Falls, Iowa): How's your back? Between races, you might ask George, a chiropractor, for a quick adjustment. But ask nicely--she is also a former Golden Gloves boxer. George has been running dirt late models in the Midwest since 2004 and last year competed with the World of Outlaws and in the Dream at Eldora Speedway. The wife and mother would like to run some ARCA or NASCAR races in 2010, but if enough sponsorship doesn't materialize, she'll stay in late models. 8 and 9. Angela Cope and Amber Cope and (Puyallup, Wash.): You have to take these platinum-blond 26-year-old twins as a package. The nieces of 1990 Daytona 500 winner Derrike Cope, Amber and Angela came to the ARCA test to get some big-track experience but don't plan to race in February. Derrike was on hand to serve as coach in a Rick Markle Racing Dodge, and both women ran well, usually within a tenth of a second of each other. They hope to debut in the NASCAR Camping World Series in 2010. Each has three ARCA races to her credit. Expected to test but didn't. 10. Michelle Theriault (Bristol, Conn.): Though just 23, Theriault has been racing since 1992 and pro racing since 2004, when she debuted in the Hooters ProCup Series. Since then, she has raced in ARCA six times and in several NASCAR Camping World truck races. She was listed on ARCA rolls as testing an Andy Hillenburg Racing car, but she isn't listed on any time sheets, so apparently, she took no timed laps during the test. 11. Alison MacLeod (Guelph, Ont. ): At 20, MacLeod is billed on her Web site as the "winningest female driver in USAC history," thanks to multiple victories in USAC's regional midget series and Ford Focus midget series. As one of Ford's development drivers, MacLeod has said she'd like to move to ARCA for 2010, but she might be wise to get experience in some lesser cars with fenders first. She was on the ARCA entry list for the test but never turned a timed lap. Women Racers - "A" comes before "D"
Nine women tested in December at Daytona for the ARCA RE/MAX 2010 series. Women represented 15% of the 60 drivers. Note that 4 women finished in the top 20 representing 21% of the top 20 drivers. ARCA uses a relatively simple point system to determine champions. There is only one scale for points awarded per finishing position. Every finishing position between 1st and 40th is separated by 5 points, with the winning driver receiving 200 points and the 40th place driver receiving 5 points. Any driver who finishes behind 40th will receive 5 points. Points are also awarded for qualifying, with: 15 points awarded to the pole position, 10 points for the second fastest qualifier, and 5 for the third fastest qualifier. There are many ways to score bonus points. Any driver who leads an official lap will receive 5 bonus points. The driver who leads the most official laps will receive an additional 5 points. All drivers who pre-enter and compete in a race will receive an additional 25 points. Any driver who enters and competes in each pre-designated 5 race leg of the overall schedule will receive an additional 250 points.